I always love to collect my empty products and reflect on what I've used up at the end of the month. On occasion, I put up an empties post or instagram a picture, but just as often, I don't (because trash is not particularly pretty to photograph). But I got to chatting with Bronzer Bunny back in May about how many samples I have lying around the house. She suggested I join her in a little project called #junesamplemonth, where we (and anyone else interested) would chronicle our sample usage for the month! 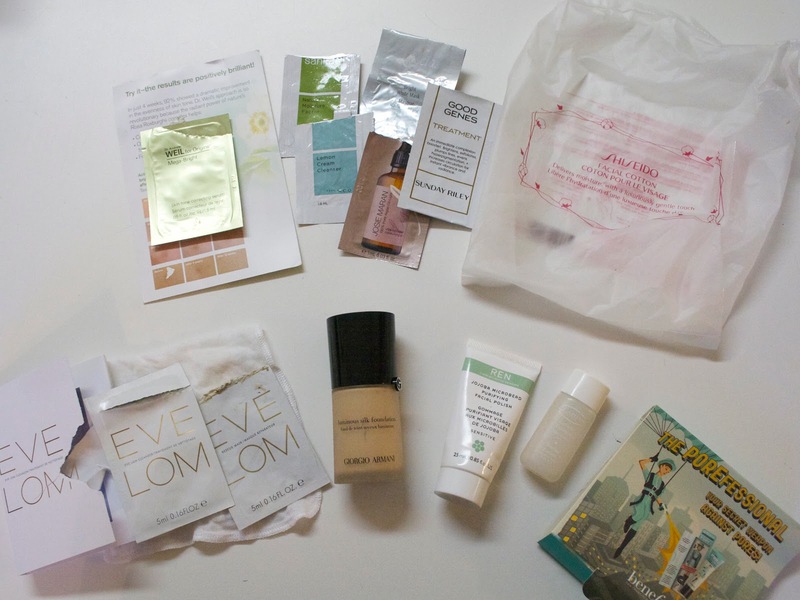 I still have hundreds of samples (ugh...I know), but I did use up a lot this month! As an added bonus, I gave some away during my blogsale and left my mom with a lot. I have about a dozen full size perfumes, but I've been neglecting those in favor of these sample size fragrances. 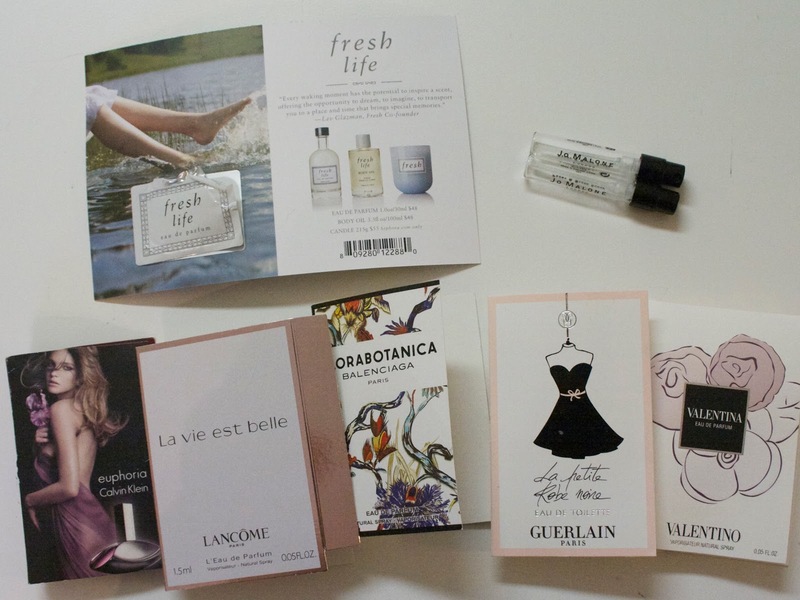 I really like both the Guerlain La Petite Robe Noire and Lancôme La Vie Est Belle. The rest were pretty unremarkable. I did get some compliments on the Jo Malone Peony and Blush Suede, but I'm holding out for Jo Malone's new fall scent: Wood Sage & Sea Salt. I've worked through most of the Bath & Body Works 3-wick candles I have and I'm trying to resist buying any more. It's a difficult endeavor, but as I'll be moving in the near future, I am trying to get rid of any and everything that will take up too much space or is on the heavy side. These candles are both. 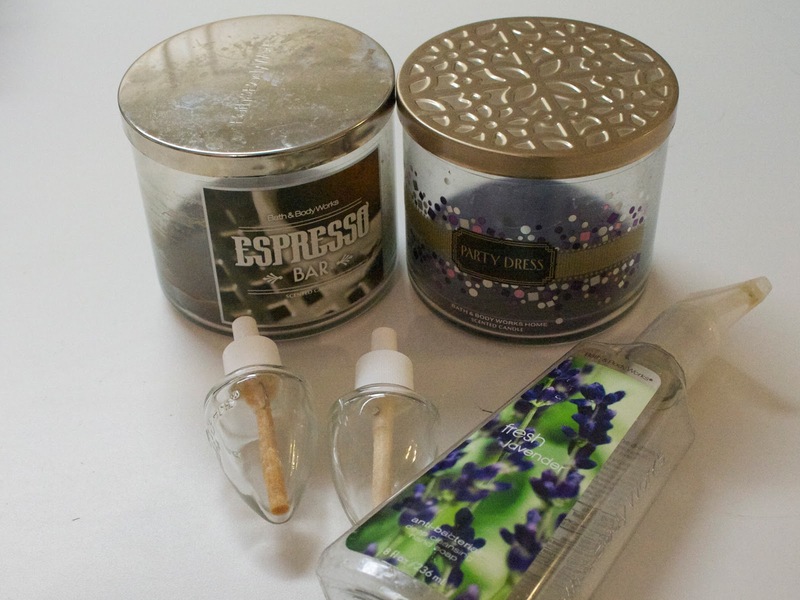 I also used up a couple of wallflowers, which are staples, and a Fresh Lavender Soap. I love the scent of lavender in the bathroom--I find it very soothing! 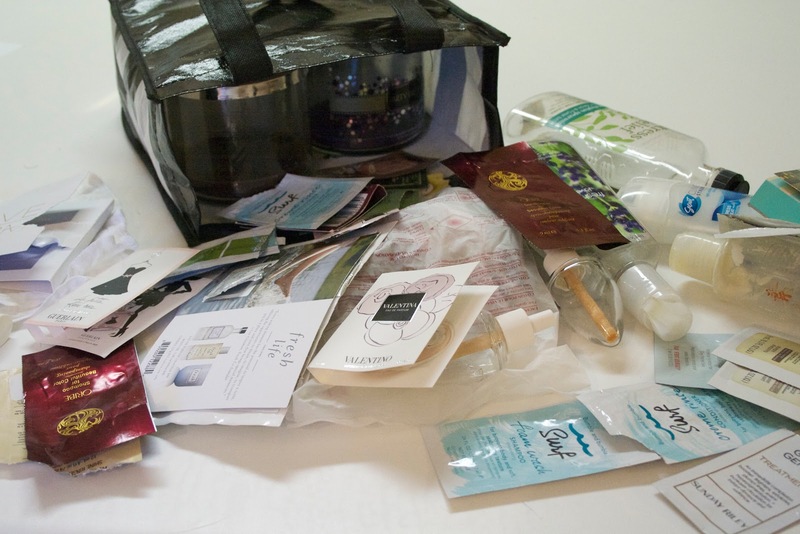 I worked my way through a lot of shampoo & conditioner sachets! I really liked the Bumble and Bumble Surf line. Once I've finished up some more samples and full sized bottles, I think I'll pick these up. I also looooove the Perfect Hair Day line from living proof! The shampoo and conditioner from this line are no exception. Truly great products that make a noticeable difference to my hair. The Eucalyptus Spearmint showergel from the Bath and Body Works Aromatherapy line was also great. One of my family members sent it to me in a care package during a particularly stressful time. I don't know if it actually helped me de-stress, but it smells divine! The crowning achievement from this picture is definitely the Giorgio Armani Luminous Silk Foundation that I used up! This is my favorite foundation ever, and I would be devastated if I didn't already own a back up! I've also already bought another package of the Shiseido Cottons. I tried going back to drugstore cotton rounds, but hated that they would shed on my face so Shiseido it is for me! I didn't particularly care for the Eve Lom Cleanser. The smell was awful and it wasn't particularly effective at removing my makeup. I also didn't see any noticeable benefit from the Sunday Riley Good Genes treatment, despite using about three sachets over the course of two weeks. The Dr. Weil for Origins Mega Bright Serum, on the other hand, was awesome and I've got a full size in my Sephora.com basket as we speak! Last but not least, I worked my way through a bunch of body lotions, a Nivea lip balm, and a Whish Deodorant Swipe (why do these exist?) I'm also on the verge of finishing up a bunch of full size items! Not only does this mean an exciting empties list for July, but it also means that I get a good excuse to buy a bunch of new products! 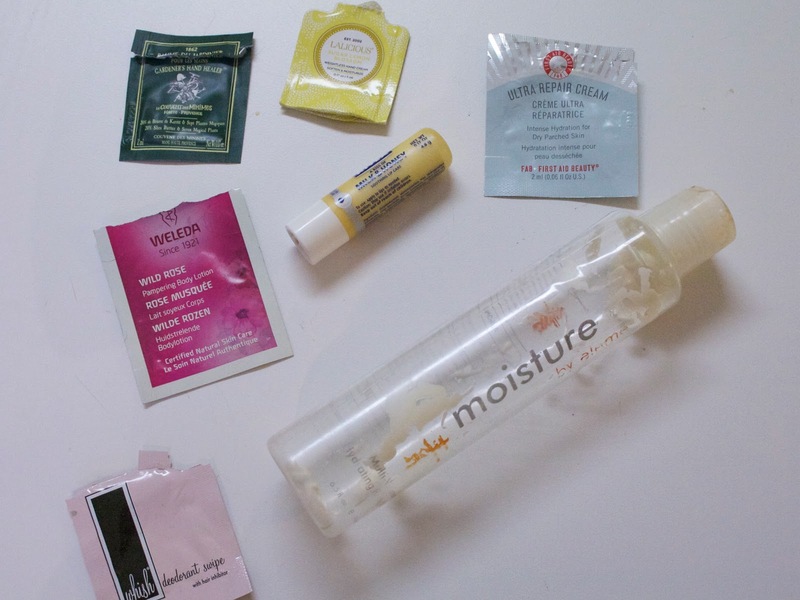 What empties have you made your way through recently? 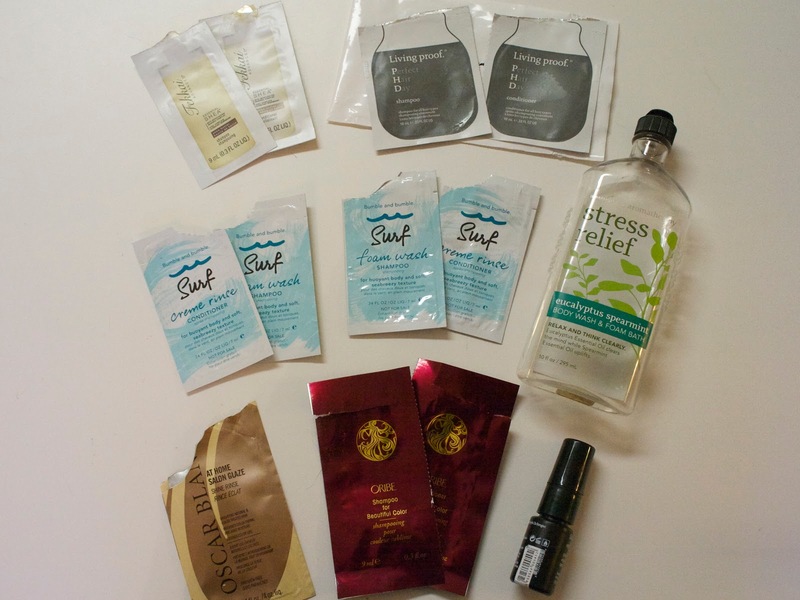 I'm going to continue my quest to use up samples, so join me for #julysamplemonth! And don't forget to follow me on Bloglovin, Twitter, and Instagram!